We have moved our production to a place called Ramoji Film City outside of Hyderabad. We have been here about three weeks with three more to go. Ramoji Film City is a trip. You can read more about that in my John in India blog. We are outside here at RFC. The weather is even more stable here than it is in California, which is why Mumbai and Hyderabad are the capitals of Indian Cinema. It's hot though, and you have to protect yourself from the sun. It's been about 90ºF every day and getting hotter all the time as the sun starts heading towards us following the Solstice. We expect to crack the mid 90's this week. Luckily I have all my set gear from days in Morocco on The Mummy and The Mummy Returns. I guess this is The Return of the Dorks of the Desert. We're not in the desert though. We have two major sets, one is a public square which features a big statue celebrating our film's hero and hosts one of the famous Bollywood Musical Numbers. The second set is a two block long city set. It's impossible to shoot in Mumbai, so we built a couple of blocks of city-scape to stand in. It will be all set extensions all the time in this set. Big green screens at the ends and down the alleys. Originally the square was to be set in amongst buildings, but we convinced the production to set it on the waterfront so that we could paint in the most picturesque part of Bombay rather than something random. We inherited a slightly larger green screen for our trouble but the trade-off is so worth it as we will have a great backdrop (that we can shoot with a camera) rather than some generic building we would have to build in CG. I am finding that here in India there is still a very linear mental relationship between money and quality. They just assume anything better will always cost more and so plan to do simple things. Generally this is a good rule, but the enthusiasm for CG sets has twisted the equation. It's cheaper to use a photo of real Bombay and do some water in the foreground than to build a bunch of "simple" generic houses with no real production value and light and render them. "You can have Bombay and it's cheaper!" totally does not compute. The other adjustment that we made to the production design was on the so-called Commercial Street. The plan was to build ten of the the twenty buildings up to 20 stories and then leave holes in between for CG buildings. I asked then to build all twenty buildings up to 30 feet and then let us extend all the buildings where needed. That way at least the shots that shoot below the 30 foot "waterline" won't have any VFX. That I think is working out well. We get into lots of trouble with the sun or the shadows coming through above the "waterline" that are supposed to be blocked by buildings, but we would have had that problem and worse if we had some tall buildings and some holes. I am expecting a lot of hassle cleaning all this up but we have gotten the reference photography and measurements we need to make it all work. How many sponsors can you count? Plus, it's more visible screen real estate for the product placement! That may sound tasteless by American standards, but here, product placement is such an important source of funding that it is as accepted as commercials before the movie :-( are in the USA. On this film, it is rumored that the money paid to have logos, storefronts, signboards, shoes, motorcycles, cars, jewelry and watches have actually turned a profit against the cost of the sets in which they appear. I was told to expect a very different style of work at Ramoji than we had at Mumbai, but if that is true it has been masked by the other more obvious differences, like shooting musical numbers and action. Those are stories on their own. Well it's been a while since the last post. All I can say, is: I've been busy! We started shooting in December and went for 20 straight days. Yes, indeed, it was "full on" as they say. The facilities were very rough but once your'e in the set it's all the same: cameras, lights, chroma screens, smoke, and tight deadlines. Less of the "can you fix that" than is fashionable in the USA, though. We did shoot off the set a lot but it was still a big set than covered most of every shot. The CG additions will be of unbuildable scale which is the way it should be. My mantra for shooting in India remains: It's more the same than different. That's not to say that there isn't a lot that's different, though. I will also say that, like anywhere, it depends on who you are working with. In my case the director is extremely well sorted out and as such we have had a lot of help getting what is needed to make the shots better. That's not always been the case on set no matter what the continent. The first thing that you expect when you start working on sets where budgets are small is that there will be a deficit of equipment and that there will be a lot more "make do" with substandard chroma screens, equipment failures and reversion to the old ways of measuring with tapes and ladders. In our case it's been a very mixed bag, but a wide-ranging one, meaning there has been very very good along with the not-so-good. In terms of chroma screens, we acquired some very nice ones that a previous show somehow managed to get into the country. This has been a great boon to us. These are the nice spandex fuzzy ones. Very good news to see these. I had been told to expect painted plywood and screens the color of Green Bay Packer jerseys. Of course we had those too and every time I asked for a screen, that's what they brought out. Every time. So every time I had to ask for the good screen, which everyone was reluctant to produce for reasons ranging from "it's not yet in a frame," to "we don't want it to get dirty by using it," (!!!) and "but we worked hard painting this one." Persistence has been the answer. You just have to keep demanding it and eventually the good screen is produced. The DoP has been a great friend in that way as he has unequivocally supported the use of the good screens at all times, even being kind enough at one point to shout at the guys with the painted boards (in Hindi) that "I never want to see that %$#@ thing again! Get it out of here!" OK, it wasn't that kind, but it was good for us and good for the movie. That's what I mean about the importance of your crew. You can have all the money to buy the best screens but if the DoP's main interest is simply getting a shot in the can and leaving VFX to clean it all up later, he'll shoot a painted board and move on. The crews that work on this film are top-flight and reflect the respect that is evident for the Director and the operation he runs. The Production Designer has been equally cooperative and helpful. He has held up shooting to tear down wooden scaffolds for us so we didn't have to hang green cloth over everything. He has watched us trying to get our tracking stickers to adhere to a painted canvas and has showed up the next day with dozens of white crosses and rigs to put them on the screens and move them from place to place quickly. Nice. World Class, as a matter of fact. I had to work overtime to get our VFX cart in shape. It's hard to get electronics and such because the taxes and duties on imports are extreme. We did finally get most of what I asked for about two weeks into the shoot. Before that we just made do with what we had and have blended our new gear into the system as we go. We got a D5 Disto and that has been a revelation. No-one had ever seen such a thing and have been really fascinated by the ability of the device to do internal triangulation for measuring distances that cannot be reached. It's made it so much easier to explain how to pin camera positions within a known volume. When the measuring is easier people are more willing to do it. That turns out to be particularly true in this environment. It all finds a home on a Bollywood set. We were not able to build or rent a full-up HDRi setup like Hoyt Yeatman's Device or similar robots, so we reverted to the fisheye DSLR model. After struggling with a hand operated tripod and the camera's internal bracketing software, we finally managed to get a good Novoflex indexed head and a small windows machine running a full-function bracket controller so we are finally getting full-range predictable HDR images. Not as elegant as the robots but fully functional after we do all the conversions. In a way the HDR solution is an example of how to take advantage of what India offers: which is abundant labor. You don't invest in a robot (or a forklift) because you can more easily afford the guys to sit down and do the HDR conversions "by hand" (or get 20 guys to carry a stack of plywood across the stage.) In one famous incident on set, the steel floor, which was perforated steel, rusted. So they ran silver paint over the floor, which had the knock-on effect of revealing that the floor under the perforations was no longer black. In the US, we would have shaken our heads, ripped up the steel, painted the floor and laid the steel back down. Here they went into the street, hired twelve guys who sat on the floor and hand painted the holes by sticking their fingers in a pot of paint and painting the floor through the perforations with their fingers. It took them four days but in the end the line producer was pleased that they had chosen the least expensive solution to the problem. OK then. As far as our elements go, this crew has been brilliant at working us into their scheme. We get HDR when we want it. The camera guys and the ADs are all helping us get whatever measurements we need, and as mentioned, dispensations on the part of camera and art dept. have been really really great. Sometimes you do find a crew that really just wants to make a movie. That has been my experience here. India is a land of contrast. There's no better way to say it. Our video assist is very low-tech by today's standard. We are shooting Super35 3-perf, primarily on Arri435s. Our Video Assist is SD video tap running into a DVD Recorder which is operated manually by the standard remote you would use if you had this device at home. It runs into an old 10" Sony video monitor. We had a mixer on set for a few days but that got the hook when the guy sitting next to the Video Assist, running Final Cut on a MacBook, was suddenly able to do full comps faster than the Video Assist could figure out how to mix live with playback. Yes, right next to the oldest Sony monitor still working, there's a full edit suite running on a laptop, editing the movie as we shoot it and defining the next setup based on a combination of replacing Previs in the cut and adding needed shots as we look at the actual movie. Most Hollywood movies can't take that kind of commitment to the cut and would need a separate generator to power a complete Avid suite out in the truck. Sometimes India moves ahead of the curve because they simply cannot spend so much money that it's not worth it because that expensive stuff doesn't exist in India. In some ways the whole project is a reflection of this. The VFX budget for a film like this, if it was done in the USA, would be so large that the producers would can the project. Here, because of the low cost of labor and the inability to make meaningful cost projections, they simply get on with it and make whatever movie they can. Projects that are worth doing get off the ground because they are good projects rather then getting shelved because of the cost projections. There are occasional tragedies. The motion control rig we got was unable to track its own remote operation head effectively and due to a misunderstanding that I still haven't figured out, none of the Kuper data was actually saved. (???) I'm not sure how they equated my constant questions about data formats and file transfers with the idea that we didn't actually need the data. So again, we will brute force it and that will be less expensive than any other option. It's actually less money that we would spend just having me worry about what those options might be. Since Christmas we've had a six week break from shooting which we have used to turn over shots, start scanning film and building post-vis and concept movies to determine the final scope of work on what we have already shot. We also spent that time prepping for the next phase, to be shot at Ramoji Film City outside Hyderabad in February. The decision on Digital (in this case Red Epic) and Film remains in limbo on our show. The key issues are the ability to monitor focus during action scenes and the potential for practical light elements to induce flicker in a majority of the shots. The latter problem is not a camera problem, it's a problem of electrical stability and not having the budget for the devices which can stabilize it. We're not too happy at the prospect of pushing over what we all see as the finer image quality of digital because of bad voltage regulators or because the resolution of the camera shows off even the smallest variances in focus, but this may be what happens. The DoP isn't happy about it either but he knows that the best looking shot ever is still NG if it's not in focus. Without a through-the-lens viewing system it's hard to be as confident as you want to be when you are shooting once and shooting fast as will be the case here in India. Our VFX team is devastated by the prospect of shooting on film after all. They have worked hard to develop a working pipeline for Red while all around were failing and now it looks to be all for naught because of non-technical issues beyond our control. It's hard to accept that this is an unworkable system when many action films around the world, including Hollywood have been successfully made with this camera. Everyone says they don't want to be the last to learn digital, but it seems that ultimately there will be a big dash for the chairs when the music stops. Today marks the two month anniversary of my arrival in Mumbai. We are getting closer to shooting every day. We are madly prevising and planning and R&D'ing and trying to pull together an organizational plan, both in terms of production and pipeline. We are acquiring talent from some of the more experienced shops around Mumbai which is having the expected effect, namely lots of new and different ideas about how to move forward, all of which have to be evaluated and placed into the context of this shop. You can't just come in and replace everything, but you do have to turn the ship. People have to embrace new and controversial ideas. In many cases this is a task of convincing everyone that there is no Magic Bullet, there is no One Best Way and that preparing for all eventualities only prepares you for the things least likely to go wrong. What is required is for everyone to agree on one way to proceed, one way to organize, one file format, etc. It almost doesn't matter what you agree on as long as there is one way to go and everyone knows what it is. That one way may change, but it's changing something that everyone will know is changing. It's the foundation that allows the change to happen without destroying everything. I spend almost every day talking to somebody about discipline. Now that we are in PrePro the tendency is to ignore all the would-be rules, like filenaming conventions, versioning, always calling the coord before showing The Boss, etc. It's no big deal, it's just PrePro. What always happens, though is that people don't try to learn the discipline until they are under fire and then it becomes duck and run when it needs to be stand and fight. I am desperately working to convince everyone to pay attention. Right now is Boot Camp and if everyone gets used to keeping their boots shiny and their bunks made, we'll still have a nice place to work when the going gets tough later on. It's in the rush to finish that people throw everything to the wind when they need to rely on their training and stay the course. That discipline is what makes shots go through the pipe instead of spilling out onto the ground. Wow, that's a lot of metaphors. We've had a lot of meetings with the director of the film. He's spent a lot of time with us going over shot breakdowns for what we will shoot in December. This is in meetings with us, DoP, Prod Designer and Action Director. Basically Heads of Department. It's a very open forum with even the PreVis leads chime in with ideas. This kind of openness requires a steady hand at the wheel. You need to hear all the ideas without being prejudiced by where they came from and then you must decide what to do. I think it's a good way to go but it is mentally taxing. I think this director is doing a fabulous job of keeping his creative environment simultaneously open and decisive. Haven't seen much of either trait lately in Hollywood. I'll leave it at that. This week will see the release of The Next Big Indian VFX Film in Ra.One. We are all waiting to see what Red Chillies, the VFX Company owned in part by the film's star Shahrukh Khan and VFX supe'd by Hollywood vet Jeff Kleiser, have come up with. It's certain to influence everything we are doing. This week is also more holidays in India. Diwali is Wednesday which is the big one. Then we have a month to get ready to shoot. It's going to be a very busy November. I made my first outing onto a Bollywood stage last Friday. We shot a camera and VFX test at a studio called Filmistan (not to be confused with Film City, Camerastan or any other similarly named Mumbai film lots.) 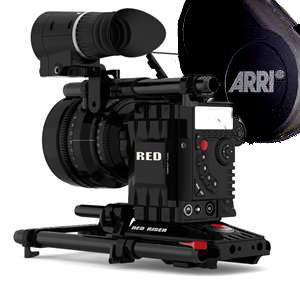 We tested an Arri 435 film camera against the latest Red Epic digital capture device. We shot the regulation grids and charts and skin tones, looking particularly at contrast and dynamic range. We also shot some effects passes using the Red Epic to check out the mattes from chroma and the viability of repeatable heads. We were in one of the smaller "floors" as they call them here. There are some nice studios in Mumbai (I am told) but this was not one of them. It wasn't a lot worse than the dumpy warehouse we shot in in Melbourne, but it was worse. No grid, oddly shaped spaces and very dirty, even by film studio standards. It wasn't too hot though which was a blessing. It was certainly workable and not uncomfortable per se but all the things you're used to, even in the makeshift studios in Australia and Canada, are simply missing. Power is hard to come by. There's no sanitation. Of the restrooms, I was told "You don't want to go in there." There were no chairs, no fire and safety areas, no controls on power and no safety officers. You just have to look out for yourself. Morocco was the same, only in India people also look out for each other, so it's not quite so dangerous. I'll be interested to see how things change when we're in full cry with big name actors around. Supposedly the big names shoot on the nice stages unless the film they are doing is self-financed in which case they apparently would rather have the money in their pockets so they shoot at places like Filmistan. We did somehow manage to get a nice green screen with the spandex textured surface which I was told was non-existent in India. Probably scammed off one of the other VFX heavy Bollywood projects headed by an American who demanded a "real" green screen. I was told to expect something like a Green Bay Packers jersey unless I used my Hollywood clout to demand a good screen. I guess that worked! Beyond the building itself, everything was pretty well sorted. The lights were not numerous but not old either. Lots of Kinos and Arris in good working order. Flags and stands were all in good shape and the people working them were professional and efficient. It worked like any other experienced set I have been on. There were a few loose ends here and there but not more than I have seen elsewhere, especially on a one-off test day. We did have HD video assist and we had a mixer (SD) for lineup. The VFX team handled all the data from the Red as we have the expertise there. We're asking for a load of work to take on the DIT and data transfer to editorial etc. but the guys are game and they know what they are doing technically so at least we can be sure that the image quality matches our exacting standards. We had a MacPro on set which allowed us to look at the HDRX output of the Red right after we shot it using the Red software. We are planning to build up a cart that will allow us to do on-set compositing of digital backgrounds in addition to QC on the Red data stream and various other VFX related malarkey. That's something you don't always get. So it's a mix of low standard amenities but high-standard filmmaking tools. Obviously it's all about the image quality in the end, so it's the right place to put the focus I think. The set design and performances will put good things in front of the camera. It's less important what's behind it. I get fat at Crafts Service anyway. More on the results of all this in an upcoming post. Working conditions are genrally pretty good. Everyone has decent monitors and appropriate computing technology. It's clean. There is air conditioning. The light is pretty good. It's a cube farm at best, though. Most places it is rows of computers set on a long desk that seats between 8 and 20 people. The chairs are good and desks are fine. There's just not much personal space. Doesn't seem to be a problem. Everyone works shoulder-to-shoulder. By American standards it would be considered a sweat-shop, but it's really nice compared to most Indian businesses and it's not uncomfortable. Working hours are usually 1030am to 7 or 8pm. It took me a little while to get used to the late start. I'm still usually one of the first ones in. This seems to be standard Indian hours. I think the horrendous commute times have made the whole commercial schedule slip later. Maybe it's just Indian time. Lunch is in the canteen everyday. I eat there a lot. Many people bring their own food which is prepared by the canteen staff. People like me without people at home to make lunch for them pay for the local fare which is usually rice and curry or dahl or masala. It costs about US$2/day for everything they have plus a soda. So far I am enjoying the food fine. When we do go out often it's fast food and that stuff, from the chains mind you, not the street stands, is pretty horrible. There are some nice restaurants around, but we usually don't take the time to go out. It's a six day week every week. People take it for granted. It's one of the aspects of work here that echoes days gone by in most parts of the VFX biz in America. I will say though that I don't think it's much different than it still is in smaller or newer companies in The States where people work ridiculous hours because everyone else is. Organizationally the company suffers from the same problems most small tech-related firms suffer with. There's a lot to be sorted and not many people to do it and when the going gets tough the discipline goes out the window and everyone just works till they drop. We are trying to change that. It's fairly endemic here. Copied from the US model when the US model was even more broken that it is now. Those old US problems manifest themselves all over. Tech guys who don't know how to talk to artists. CG guys who just want to show off how cool the CGI is rather than actually make the movie look good. Animators who want actors on the set to be told what to do so that the animation will be easier, etc. Patience is required but the willingness to move in a different direction seems strong to me. People are listening up. They realize they won't move forward without change. Seems obvious but we've all seen the "it's good enough" mentality wreck projects. That's not apparent where I am in Mumbai. People are motivated to do better work than they have done before. We're changing the way things are being done. The trick will be to hold it in place when the pressure comes on full. I'm finding a mixed level of talent but always some good talent, so there's always a place to start. It's not as much of a "just throw bodies at it" mentality as I feared. Team building is no problem. It's a relatively egoless and flat structure where everyone feels comfortable contributing and no-one is told to shut up because it's above their station to talk. Ironically, in a society still attached to their own class structure and to Britain's as well, I find the openness to ideas is much greater than what is available to most VFX artists in the US. Communication systems need to be improved though so that the teams can work more effectively. People use cell phones to communicate because the email is so unreliable. That has to change. The information flow needs to be consistent and effective. That's a solvable problem, I think. It just needs to be made a priority. Overall the situation in this small company is completely workable. We still need to improve lots of things and we need more talented artists, but we're not floundering and there's no foot dragging on the required changes. Might be the honeymoon but we are making hay while the sun is shining. Here's the lane the building is on. It's not as smooth as it looks. And here's the building. Somewhat incongruous. After you get your visa and get to India you have to register with the police as a foreigner residing in the country. This is really common if you're staying anywhere as an ex-pat for any period of time. Sometimes it's as simple as filling out a form and having someone stamp it or a quick visit to your local constabulary. In India I was given a guide (a godsend really) from HR at the company in addition to a driver and we headed off on a Saturday morning to the main police station in South Mumbai which houses the FRRO, Foreign Regional Registration Office. I was given this big folder of paperwork, mostly the same stuff I needed for the visa in the US. I also need my passport/visa and four more passport pictures and money to pay the fees. People were not at all certain what the fees would be. Anywhere up to 2000 rupees was estimated. It ended up being just 150 rupees, which surprised the HR guy. When I got to the entry to the FRRO the people at the desk reviewed my papers and then wrote some numbers on the cover and said I needed to watch for the counter inside. They then sent me through a door that my guide said was for foreigners only and so he could not follow. He said I would find a computer and I should enter my information. There was a big room filled with folding chairs and lots of people from all over. There were computers in the back. I sat down at one and answered all the questions, Passport number, visa number, type, where issued, airline I flew in on, DoB, parents home, where I'm staying, airspeed of fully laden swallow, etc. I then needed to print it out. After asking, "What next?" I was pointed to the front of the room where there was an LED sign displaying counter numbers and which number was being served. I found out that not everything is covered by this system. It turned out I was scheduled for Counter 3A, which was not on the board and was turned away from Counter 3 when it hit my number. I was told to wait for someone to come get me, which eventually did happen. I had to go in and review the paperwork again, then wait, then pay the fees, then fill out a booklet with the same information on the printout that I had given them earlier. I guess they didn't save that data. Maybe that's good. Anyway it was typical duplication of effort. Then I had to wait again. Then they came out and handed me the book, now stamped and certified and said I was done and could leave. The HR guy was thrilled. It took 2 1/2 hours (mostly waiting) and we were done at 1230pm. He thought it would be at least 4pm before we got done. So now I have my little black book that identifies me as a legal foreign resident of India. Apparently this is an important document in some circumstances which I hope not to find myself in. Or maybe I just need it to ride the train. Possibly I can wave it at shopkeepers who charge me the Tourist Rate and get the local price instead. Haven't had to try that yet. As I said, patience was the key, and having your paperwork sorted made it go twice as fast as usual apparently. Kudos to the people at my company in India for making sure it was together.